Ordinary number signatures Pramuan-Chawalit UNC about 35 - 40 baht. Ordinary number signatures Sommai-Kamjorn UNC about 40 - 45 baht. Ordinary number signatures Banharn-Wijit UNC about 60 - 65 baht. Ordinary number signatures Weerapong-Chawalit UNC about 300 - 310 baht. Solid number set 1's - 9's (9 notes) signatures Pramuan-Kamjorn UNC about 75,000 baht. 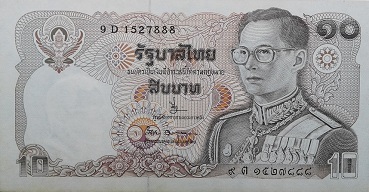 This 10 baht banknote was issued on September 20th, 1980. The whole design of the banknote also was used on the commemorative banknote on occasion of 120th year celebration of the Ministry of Finance in 1995. The main color of the banknote is light brown. The main object is the image of King Rama 9 in the uniform of the Supreme Commander. 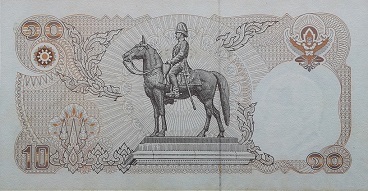 The main object is the image of the equestrian statue of King Rama 5, at the front ground of the Anadasamakom throne hall.